“It is estimated that patients forget 60-70 percent of the information critical to the their care. Ineffective communication appears as a risk factor in claims and lawsuits with discouraging frequency despite our best efforts.” – Carole Lambert Vice President, Practice Optimization for the Cooperative Of America Physicians, Inc. It is not about what you might say incorrectly. It is about meeting your burden to prove you communicated the appropriate information – no more “he said/ she said”. Informed consent is not a piece of paper. Pre-recorded content that addresses all the critical information required aids the provider in a properly communicated informed consent. Patients forget up to 80% of information. Allowing patients to access video interactions with their provider after a visit allows for more engaged patients who feel part of and have a better understanding of their treatment plans. Pre-recorded consents and conflict of interest disclosures. 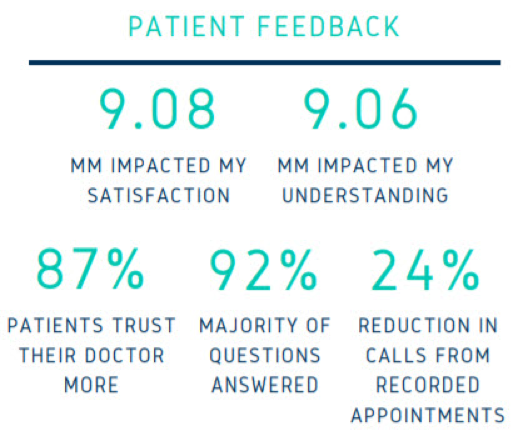 Not only do providers save time, they insure the right message is delivered 100% of the time. Medical Memory digitally captures when the patients watched the video and that they consented to understanding the content provided.